Four of us joined an official SPS group, for an informal joint trip, to do Clouds Rest from a trailhead near Tenaya Lake. They had a large group of people. In the early morning, one problem we had at the trailhead was that we couldn't get the new, bear-proof garbage can open. The latch may have been frozen shut. There was continuous snow cover right from the parking lot. Having no open trail, then, this was a real navigation exercise. I was content to follow with my group of four mingling with the SPS group. There was a stream to cross, with a natural, narrow, log bridge. At its end, one poor girl mistook a cluster of floating pine needles for solid ground, and plunged into three foot deep water. We had a time watching as each person crossed the log. This was a tightrope act balance effort. Trodding on through endless snow, we eventually came to the summit ridge, and then, gained the glorious summit view down into Yosemite Valley. The hike in summer normally is about 6 miles each way, with 2,500 feet gain. The weather was great. One hiker in my group couldn't handle the exposure down into Tenaya Canyon. It was a smooth slope downward for six thousand feet. She wasn't trained to use an ice axe or climbing at all. That was a lapse of mine that the SPS leaders had to handle. She was left below with one other tired hiker. I snapped plenty of photos. 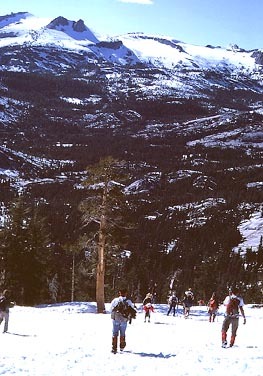 With the snow, the summit is not then attainable for most hikers. When it is gone, it's a far longer upward pull from Happy Isles, the Valley trailhead for this hike. Only a strong hiker would make it from there. It was then time to head back. We picked up the two other hikers. I had never before seen so many climbers together coming down a mountain. The snow was good for sliding. I performed a standing glissade wherever I could. We then came back to the big creek, and the others crossed a snow bridge. As the last person before me crossed, the snow bridge collapsed. The others laughed as my face fell. I tossed my camera equipment over to the leader, and jumped the creek after a good run. Others chose to wade at a spot further upstream. This was a good climbing group. On the return to the cars, my group headed off to do our own climb for Sunday. We went to Lee Vining for meals. The next day, the beginner lady chose to explore Mono Lake while we did Mt. Warren. Starting along the Tioga Pass Highway, at a pullout a few miles east of the Pass, we parked and began our climb. The snow was a help, since the rock rubble was rough and loose. 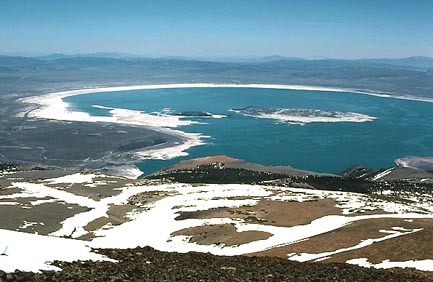 We summited in due time and enjoyed the view of Mono Lake and to the south. A communications facility is located on the top. "So much for wilderness," my companions remarked. The snow was softer on our descent. We'd plunge step down, to have to slow, since one might sink suddenly in the snow a foot or two. At a run, that could cause an injury. We returned at a set time to meet our beginner climber, and drove merrily home. She had a big adventure for herself. On her own, she had gone to the Mono Lake shoreline and tasted the lake water. I then regretted leaving her on her own, but she had a responsible job position. I heard no later reports of problems. These were two fine peaks, with a shorter drive for our group. Many in the SPS group chose to begin driving home after Saturday's peak. They mostly live in the L.A. basin. 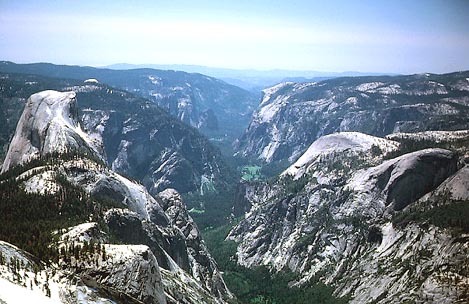 On this trip, I realized the power of a fine training program, like the Sierra Club runs down there. Here up north, you might ask of an applicant's skill level, and find they have no idea what you mean, being accustomed to only normal, easy trail hikes. That could lead to misunderstanding, and thus considerable danger, for all of us, on harder climbs.